I was surfing the net looking for recipes for the harvested vegetables I’ve purchased at our local farmers markets. I’m sure you can relate if you have your own vegetable garden and don’t can and freeze or are a member of your local CSA. I found this recipe and made it. It was fabulous! I just had to share. I prepared the fennel tomatoe sauce recipe (to much delight) in advance. I had fresh spinach, zucchini, yellow squash,thinly sliced eggplant and tomatoes. Each guests plate was different and beautiful. When it was time to eat…there was silence….I thought…was something wrong? Nope, just too good to comment. Everyone was experiencing the wonderful combination of flavors melting in their mouths. I call food like this “rockers”…so good you rock yourself back and forth as you are eating it. This was most definately a “rocker”. Thank you Heidi for this wonderful, wonderful recipe. And thank you Google for finding Heidi. Go directly to 101 Cookbooks to read more pointers on this recipe. Her fennel tomatoe sauce is to die for and either of the two doughs are yummy. The pizza in the photo was made with the fennel tomato sauce: caramelized fennel & pitted black olives with a bit of grated Gruyere cheese. 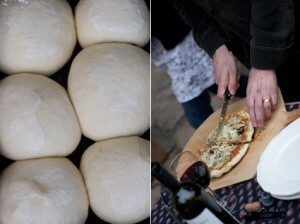 White Whole Wheat Pizza Dough or Peter Reinhart’s Napoletana Pizza Dough recipe. 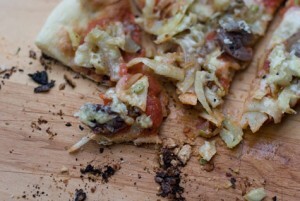 - caramelized fennel & olives: Made by slicing fennel thinly, but not paper thin (a mandolin does the job). In a large skillet over med-high heat, saute the fennel in olive oil for 3 or 4 mins, to brown a bit. Turn down the heat to low and cook for another fifteen to twenty minutes. A few minutes before the fennel is done, toss in a handful of your favorite pitted olives. When you are ready to pull out the dough, go for it. Try not to over handle the dough, but like it to be an even thickness throughout (so you aren’t fighting parts that are burning, while other parts are still doughy). Brush olive oil on one side, and turn that side down onto the grill. Now that the dough is on the grill, brush the side that is face up with olive oil. If you are on a gas grill, this is when I’d slap on the cover in 20-30 second stretches. Check on the bottom of the dough often, and when it is deeply golden, flip the dough. Get the toppings on quickly. In this case, brush a thin layer of tomato sauce across the pizza, a dusting of cheese, and a generous tangle of the fennel and olives. Check on the bottom of the dough regularly, and when it is deeply golden use a baking sheet or pizza peal to remove. Dust with a bit more cheese, a drizzle of olive oil and enjoy. Experiment with different toppings, that’s half the fun. Another suggestion is a spinach & pea ricotta pesto, thin slices of new potatoes, Gruyere, and drizzled with hot sauce.